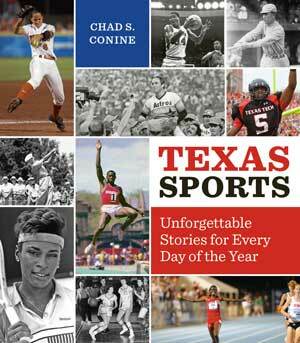 With a stirring story for every day of the year, this book celebrates the athletes and teams in more than twenty-five sports that have made Texas a dynamo in the world of sports across more than a century. When it comes to sports, Texas more than earns its bragging rights. The Lone Star State has produced championship teams and legendary athletes not only in football, baseball, and basketball, but in dozens of other sports as well. Texas Sports celebrates more than a century of achievements in a day-by-day record of the people and events—both unforgettable and little-known—that have made Texas a powerhouse in the world of sports. Chad S. Conine packs a wealth of sports facts and stories into 366 days. He ranges from firsts such as UT’s first football game (an 1893 win against Dallas University Football Club) to peak moments such as Earl Campbell running through defenders, Nolan Ryan throwing heat past baffled batters, and Babe Didrickson Zaharias winning the Western Open golf championship for the fourth time. Conine covers more than twenty-five sports and all levels from high school to professional, reminding us that if Texas had never seen a pigskin or a backboard, its sports legacy would still be secure. With a winning combination of victories and heartbreaks, men’s and women’s sports, and all regions of the state, Texas Sports is a must-read for all sports fans and trivia buffs. Conine is the author of The Republic of Football: Legends of the Texas High School Game. As a reporter, columnist, or author, he has covered Texas sports for twenty years—everything from Tuesday night high school volleyball matches to Thanksgiving Day Dallas Cowboys games.